We finished The Grim Grotto yesterday. Now we are bereft, a word which here means, we want to start the next book in the series right away but are sad to find that the inconsiderate author has not obliged us by having published it yet. Anybody heard how long we have to wait for Book the Twelfth in Lemony Snicket's Series of Unfortunate Events? Have you heard what it's called? What it's about? Tell me, please! I don't think we can stand the suspense! By we I mean the 8 year old and me. The blonde and the 11 year old are a little more even-keeled about it. I've been impressed by the 11 year old. He's been waiting two and a half years now for the final Star Wars movie and not even seeing the trailer at the beginning of The Incredibles last month has caused his Jedi-like patience to fray. But his brother and I are as anxious to get our hands on the next installment of the Baudelaire orphans' woeful tale as Count Olaf is to get his hands on their fortune! Maybe we'll be able to tough it out, a phrase which here means, Not drive ourselves crazy with expectation between now and the time when Lemony Snicket's editor decodes the torn pages Snicket sent him from the Hotel Denouement and locates the manuscript Snicket has hidden in, it appears, the Galway Kennell. We survived the wait between finishing The Slippery Slope in September and the library's delivering our copy of The Grim Grotto just in time for Thanksgiving vacation. Devoted friends of the Baudelaires will point out that the book was in the bookstores in October. Yes, but we weren't waiting for just the book. When I say we've now read all 11 books, I mean that we have listened to all 11 books. Tim Curry has read them to us. Well, Tim Curry read us Books the First and the Second and the Sixth through the Eleventh. Lemony Snicket himself read the other three. Say what you will about Curry's performances in The Rocky Horror Picture Show or The Wild Thornberries Movie. They pale in comparison. The work he does on the Series of Unfortunate Events is one of the best acting jobs I've heard or seen. I love the darkness he puts into the word dark whenever he gives Esme Squalor's address, "667 Daaaarrrrrk Avenue." And the tears that fill up the words and make his pronunciation of "Lake Lachrymose" drip with melancholy. And what Curry does with the 209 evers that take up two whole pages in The Reptile Room makes for a glorious, and hilarious, aria for unaccompanied human voice. Books on tape have been one of the secret joys of parenthood for the blonde and me. Not to mention the salvation of a hundred long distance car rides. In fact, I was enjoying listening to the boys' books so much that a couple years ago I began listening regularly to grown up books on my own. Since then most of the books I've "read" have been books I've had read to me. This has created some confusion in my own head about my reading. Often I'm not sure if I liked the book or liked the reading of it. Sometimes it's clear. I like Jonathan Kellerman's Alex Delaware mysteries because I really enjoy John Rubenstein's reading of them. I'm pretty sure if I ever tried to read them to myself I'd find them slow going. On the other hand, I like Robert Parker's Spenser novels whether or not I read them or Joe Mantegna reads them to me. But I can't say whether I liked Brideshead Revisited because of what Evelyn Waugh wrote or because of how Jeremy Irons read what Waugh wrote. The part of me that's a reader is conflicted. But the part of me that loves the theater (but never comes late) and movies because he loves good acting has no problems with it. Some of the books I've listened to have included the performances of their careers by the actors reading them. There's Rubenstein and Curry, of course, but Stockard Channing's work in her readings of Beverly Cleary's Romona novels is also wonderful! Jon Cryer will never get another gig as good as the one he's got doing Chet Gecko, the best lizard detective at Emerson Hickey Elementary School. And while Joe Mantegna does a fine job on the more recent Spenser novels, you should try to find Burt Reynolds' readings of Stardust, Chance, Small Vices, and Hush Money. Harry Potter fans know that what Jim Dale's doing with his reading of the books is better than anything that's been in the movies so far and it was stupid of the producers not to hire him to replace Richard Harris as Dumbledore. They had a chance to wise up and use him as Mad-Eye Mooney in Goblet of Fire but apparently they've blown it, again. Ralph Fiennes, though, is an excellent choice for he who shall not be named. Anyway, I could go on and on. There's William Gaminara's Sharpe, Elliott Gould's Philip Marlowe, Martin Jarvis's Bertie Wooster and Jeeves. Plenty of others. But if any of you have some favorites, I'd appreciate it if you'd put them in the comments. Christmas is coming and we've got some traveling to do. We started Book the First while in Milwaukee -- it was a giveaway in the Country Inn & Suites book-exchange program -- and Kate finished it on the ride home. She was mightily impressed, as was I. Tim Curry should have gotten Jim Carrey's job. Galway Kennell - ah hahahahahha! I think that books 4-6 should be combined into a movie, then 7-9, then 10-13. the last four are the most informative and important. I can assure you that it is NOT the Galaway Kennell. One. Where is the clue in the picture at the end of Book the Eleventh? and Two. The Next Book Will Be about the Hotel Denouement. I know this because at the back of book 11, there a bell boy's cap in the sand that says "Hoetl D" and i have found out that this "D" stands for Denouement. Thanx. Oh!... and it should be coming out October 2005 sometime. Thanx. I know when A Series of Unfortunate Events, Book the Twelfth is coming out. It is going to be in hardcover sometime in the middle of October, 2005. At least that is when it is coming out at Barnes & Noble. That is pretty much all I know so far. I will try to keep posting more info as soon as I can. Handler calls himself Lemony Snicket because he doesn't want his enemies to know his true identity, I heard an interview with him a few weeks ago and I heard that book the thirteenth will come out next year. By the way, I researched VFD and as far as I know it is Volunteer Fire Department. fun fact lemony snickets real mane is daniel handler! th last book may be called the vicious virtory or the frightening finish. When is Bambi coming out? I didn't mean to say that, when is Bambi and the great prince of the forest coming out? Which books have you read recently and enjoyed? I'm Mr Mannion and this is my website. I'm glad you're all having fun talking about my sons' favorite series of books. I put this post up in November and it's been a long time since it's shown up on my page, so I can't always police the comments section here. A very rude person showed up yesterday, and I deleted his comments and banned him from the site. Everybody leaving comments on a website should be as kind and polite as the Baudelaires themselves. If you read any comments that upset you, don't acknowledge them or answer back. Email me and let me know and I will take care of it. The picture at the back of the Grim Grotto is the small bubbly thing- it's the airship. I think the twelfth book has something to do with the airship thing. Also in the Eleventh book at the end it says, "...turning the tables of their lives and breaking the unfortunate cycle for the very first time." So something happy is going to happen. he did say in an interview on the internet that he hasn't finished researching the lives of the Baudelaires and that there might still be more information he hasn't found. Also I emailed him asking him all the questions I wanted to know but Daniel Handler sent an email back to me saying that he can't tell me because it would be much to dangerous for me to know even if he told me in secret. i completely agree with the person who said that tim curry should have been count olaf. jim carrey kind of...over did it. Is it true that the 12th book is called the Heinous Hotel. I also herard its coming out in october. I can't wait til' then. 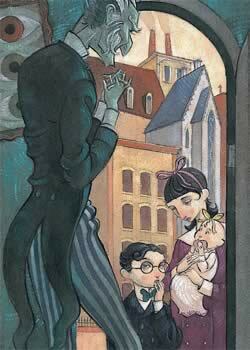 The 12th book of series of unfortunate events is calld:The Toumbling Towers.It comes out October18,2005!. the 12th book is coming out october 18th and the books going to be called the heinuos hotel. maybe you guys didn't notice but in the last picture of every book there's a hint. like in the first one there's a snake in the picture.in the 11th one there is a hat on the beach that says hotel d. that means the title or the book is going to have hotel in it. Also lemony snicket and daniel handler aren't the same guy. Beatrice is not the mother of the three baudelaire children. and lemony did get married to her they just have't come up in the story yet. in case you haven't noticed but it said that beatrice is dead. but it also said that one of their parents might be alive yet it said the father will never rise. which leaves the mother. Lets talk about Harry Potter, did you know that Harry Potter and the Goblet of Fire's coming out in November 18th and the trailer's coming out in May. Also during the premier of Harry Potter and the Chamber of Secrets the people who take part in the film are going to show us clips and trailers of the GOF and there are going to be interviews with cast members. Check the proggramme out on May 7th 2005 at7/600pm Saturday. The hat on the beach that said Hotel D says Hotel Denouncement. Some of the people on here are saying that book the twelfth is going to be called "The Vicious Victory" but it's the twelfth book, and the thirteen ends it all. Plus Lemony Snicket already used V, and he already used H, too - for people who think it's "The Heinous Hotel." I'm pretty sure it does have something to do with the hotel though. We'll just have to see in October! what does him already using H in one of his books have to do with anything. And if your sooooo smart than whats it going to be called. exactly non of us know. Also i'm going to laugh so hard at you if it turns out to be the heinous hotel. sorry i'm getting mad here but you don't know what it's going to be called. so if someone has a guess of what it's going to be called then don't go off telling them it's wrong because YOU DON'T KNOW. i cant wait til the twelfth and thirteenth books come out! is it true that Count olaf will get the baudelaire fortune, Quagmire sapphires and the Widdershins fortune? what happens to the Widdershins sibblings (Fiona and the hook-handed man who's name is Fernald)? the widdershins are my favourite characters. i don't know....a poet and a mycologist. kind of neat...wat happens to them? are they rich? in the eleventh book olaf said that he was going to get the widdershins fortune. are they rich? oh...and where on earth is captain widdershins and that optimist named phil? Who are Lemony Snicket's parents? Who are the Baudelaire's parents. You have a lot of info, but where's the hint in book number 6? I'm really sorry but I don't have the 6th book. I have all of them except 5,6,7. I would get them but i'm broke. if you have any other questions than i'd be happy to answer them. And also to what's it to you i'm sorry I was getting so mad. The next book, no one knows. It's NOT called the Henious Hotel, it may be Hotel D, although Hotel D will be very much involved with book 12. I belive it was going to be called the Tumbling Tower?? It's coming out October 18 2005. The thing with Beatrice being the mother and Lemony Snicket being the father, research might have gone way to your head, or thats just a simple theory. Daniel Handler does have a wife, whcih he mentions in an interview. I just want to know how you know that it's not going to be the heinous hotel. but it could be called the tumbling tower. we all don't know. I heard from someone else it's going to be called the zymology zone. Simple- Henious Hotel? Not very likely. *keeps breathing* guys. Beatrice is dead. They were at a masked ball apparently when beatrice was killed. If she is indeed the mother, what the heck was she doing at a masked ball at the time of her death! Also, lemony snicket could not have married her because she was dead before they were able to be married. Please pay attention to the side stories. I'd more believe that we have not yet met mister baudelare. Nor will we ever. i think that the survivor of the fire was quigley quagmire, who tells the baudeares that he found himself in the remains of a burned home. hmm? that sound familliar? it was the passage between 667 and the mansion... I think perhaps that it has to do with the mushrooms growing on the rocks. I found 'Lemony snicket: An unauthorised autobiography' usefull. It tells you a bit more about the story. I wanted to tell you guys again that lemony snicket and daniel handler aren't the same person. lemony doesn't really write the books. somthing is cool about book the 12th. it's is coming out 10-18-05! that's the day of my birthday! really!!!!!!!!!!!!!!!!!!!!!! Hi people. I am new to the website. I only have the first four books.